There’s no better time than now to invest in the beauty and value of your home. Replacing old and outdated floors is any easy way to get the results you desire. If you are ready to start the replacement process, consult our local store for the perfect flooring solution. Laminate flooring is a practical option that delivers the look you want for less. Designed to mimic popular tile and hardwood materials, the latest laminate styles are sure to impress no matter where they are placed. We are proud to carry the area’s largest selection of laminate products. While selecting the ideal option for your project may prove to be a challenge, you can depend on us to make shopping for new floors as easy and enjoyable as possible. By utilizing the buying power of the Flooring America franchise, we save on the latest floor fashions and trends. The savings we experience are passed on to our clients in the form of everyday low prices. Whether you are interested in classic laminate tile or are considering rustic laminate planks, we guarantee you won’t be disappointed with the affordable options available at our location. The collection of laminate we carry features some of the industry’s leading brands and manufacturers, such as Floorcraft. 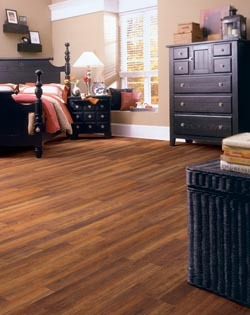 This means that the laminate floors found in our inventory impress in appearance, performance, and even price. One of the in-store associates on staff will be pleased to help you navigate the many laminate options we carry, ensuring you only make a purchase with the utmost confidence. Why Choose Laminate for Your Home? Laminate, like many other engineered flooring materials, holds up well even in the busiest of households. Today, it is considered one of the most family and pet-friendly types of flooring available. What sets laminate flooring apart from the competition is its ability to perfectly replicate the look and feel of popular high-end materials. Our commitment to your satisfaction doesn’t end when you make a purchase. To ensure your floors surpass expectations, we handle the laminate floor installation on your behalf. Our experienced technicians have undergone special training in order to handle installation projects with the utmost speed and skill. Even after your new flooring is installed, we remain dedicated to clients like you. Should you be unhappy with your floors for any reason, you can take advantage of our unparalleled guarantee. The guarantee is a promise to replace the unsatisfactory floors with a comparable product for free if you contact us within 30 days of the initial install. Stop by the store location today to peruse a vast selection of exquisite laminate floors. If you want to learn more about our laminate options in advance, call <PHONE> at your earliest convenience. We proudly serve residents of New Hyde Park, Floral Park, Great Neck, Manhasset, and Garden City, New York, as well as the surrounding areas.